This page is about the level in Shadow the Hedgehog (game). For more on Prison Island in Sonic Adventure 2 and as a storyline location, see Prison Island. 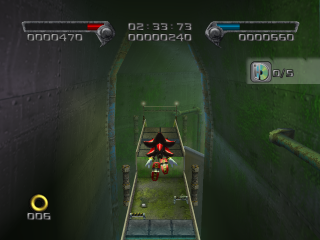 Prison Island one of three possible third levels of Shadow the Hedgehog; in the game's branching path structure, it follows from taking a more neutral, non-aligned path through the previous levels. Shadow returns to his long-time place of incarceration in search of the grey Chaos Emerald to find it a radioactive ruin after the events of Sonic Adventure 2. Free-flowing rivers of glowing green sludge course around the level; use Air Saucers and spring pads to navigate down the poisoned waterways. Chaos Controlling all over the place during the Black Arms invasion of Sonic's world, an amnesic Shadow returns to Prison Island to collect that damn fourth Chaos Emerald. Only after arriving does he recall the place had any previous significance to him, with brief flashbacks triggered to his release from cryostasis. Prison Island has gone vastly downhill after Robotnik's terrorism. While GUN still maintains a presence there, they now share the island with free-flowing rivers of glowing radioactive sludge and rampant jungle overgrowth of the once-mighty military prisons. In fact, there are only mechs in this level, with no actual human soldiers at all, implying that the island is now pretty much uninhabitable. A few Black Arms have been captured and interred, but others run free and are fighting the robots. Shadow can either help the aliens wipe out the defenders, run straight for the Chaos Emerald, or assist Charmy Bee, who - on Vector's orders - is exploiting the confusion to steal top secret military information for Team Chaotix's morally dubious detective work.